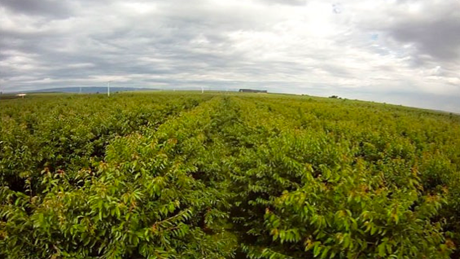 At this time of year, Washington state’s cherry growers have their local helicopter pilot on speed dial. 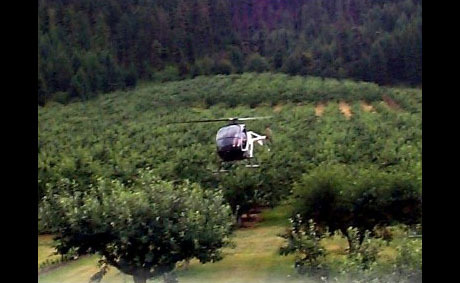 IMAGE: A helicopter acts as a giant blow dryer above a Montana cherry orchard. They are not taking triumphant joy rides over their ripening red crop, or conducting aerial surveillance of their picking force. Instead, they are paying $600 a day for the helicopter to blow dry their cherries. IMAGE: A still from a pilot Maria Langer’s helicopter nose-cam (via An Eclectic Mind). 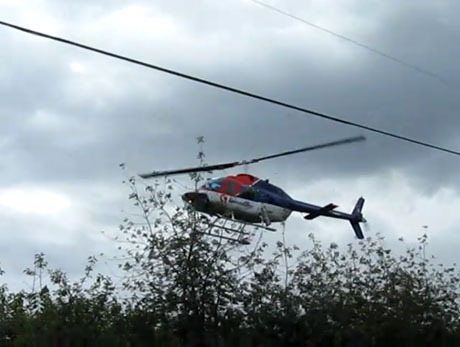 IMAGE: Still from a YouTube video of helicopter blowdrying a cherry orchard. The cherry drying business is seasonal — Langer travels up to Washington from Arizona, where her normal business lies in tours and aerial photography, each summer. It is also dangerous and boring, but utterly unique — cherries are the only fruit dried by helicopter, because of their vulnerability and value. In fact, the next cherry you enjoy might have been dried four times or more, while pickers climb up and down 10-foot ladders, “visiting and revisiting the trees a minimum of three to five times to pick each cherry as it comes to maximum size and ripeness.” And that’s before they are hydro-cooled, sorted, and shipped to the consumer in twenty-four hours or less. Understanding the effort that goes into this harvest makes a punnet of fresh, ripe cherries — already semi-miraculous — truly seem more precious than a ruby. Note: The Seattle Times story found via @helenabottemiller. 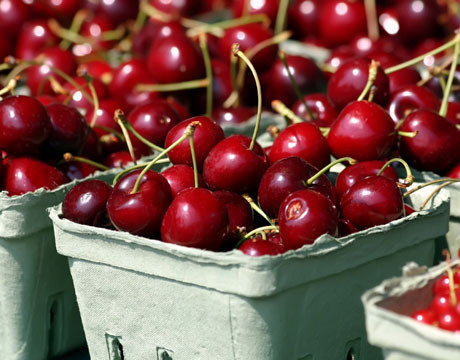 Another detail about the cherry harvest is that you’ll hear booms reverberating in the hills throughout the day. I think it’s to scare off birds who want to eat the fruit? I should eat more cherry pie! Not just cherries. I’ve seen helicopters used to dry oranges in much the same way, but not because of swelling but because of freezing.